Some curved surfaces may be defined as generated by straight lines which are thought of as moving and changing their direction continuously. Suppose that the line cuts a fixed curve not in the same plane with a straight line. If is allowed to move so that it always remains parallel to its first position and always intersects the fixed curve , it will generate a curved surface called a cylindrical surface. A cylinder is a solid figure generated by a straight line moving to its original position, while its end describes a closed figure in a plane. It is thus a limiting case of a prism whose ends would be circles, ellipses and parabolas, etc. 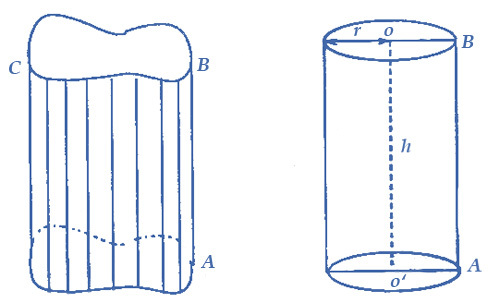 If the generated line is perpendicular to the base, then the cylinder is known as a right cylinder, otherwise oblique.